The Onyx Clownfish (True Percula) are found in reefs near New Guinea, and are named because of how black they get. Their black coloration around their white bars will increase with age. 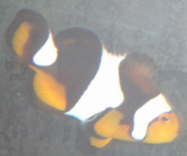 This clownfish is in excellent condition! It has been here since May and has a great personality! They are intolerant to copper (medications).